More than 25 "good Scouts" from Oak Lawn staged a clean-up Sunday of historic Bachelor's Grove cemetery in Orland township, one of the oldest burial grounds in the area. The Scouts were members of Trinity Lutheran church Girl Scout troop 636 and St. Gerald's Boy Scout troop 619 plus members of the church's Cub Scout troop. The young people braved the cold and rain to hold the clean-up, which was in response to an article about the plight of the cemetery in the Suburbanite Economist last month. The idea for the event was that of Mrs. Audrey Peters of Oak Lawn, who is the leader of the Girl Scout troop. The Scouts worked for about five hours Sunday and hope to return later after the weather improves. 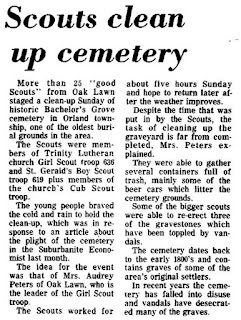 Despite the time that was put in by the Scouts, the task of cleaning up the graveyard is far from completed, Mrs. Peters explained. They were able to gather several containers full of trash, mainly some of the beer cans which litter the cemetery grounds. Some of the bigger scouts were able to re-erect three of the gravestones which have been toppled by vandals. The cemetery dates back to the early 1800's and contains graves of some of the area's original settlers. In recent years the cemetery has falled into disuse and vandals have desecrated many of the graves.